The Heroes of the Storm came with several new announcements at this year's Blizzcon. Shacknews caught up to a few of the game's designers to learn more about the game's new characters, the new Arena mode, the new Towers of Doom battleground, and how the Overwatch characters will fit into the Heroes of the Storm world. Heroes of the Storm was definitely not light on announcements during yesterday's Blizzcon keynote address. Three new heroes are going to jump into the fray, while Heroes will also get one of its first non-traditional MOBA maps and a whole new game mode. That means there's a lot to catch up on, so Shacknews met up with technical director Alan Dabiri and technical designer John Hodgson to learn more about all that was revealed. That means asking about the game's first two-player character, the alternative winning conditions of the Towers of Doom, and looking ahead to the future by looking into imminent debut of the Overwatch heroes. Shacknews: You unveiled Arena Battlegrounds. How is this new game mode going to work and how is it going to be different from what we've seen from standard Heroes of the Storm games? John Hodgson, Technical Designer: The standard mode is very much a traditional Heroes of the Storm experience, where you'll start at level 1, you'll earn experience together, you'll complete map objectives, you'll try and destroy the enemy core. In Arena, there is a specific objective on each map. It could be anything from control this point, like a 'king of the hill' style map, collect certain map objects. We have some of the themes of the current maps that we have. Every Hero that we have starts at level 10 and instead of picking the Hero at the beginning of the game, you are presented with three Heroes to pick from that are randomly selected, kind of like Hearthstone allows you to select three different Heroes at the beginning of their Arena game. Everybody will start off at level 10, you'll get to pick your Heroic ability, and it's just a no-holds-barred team fight. Alan Dabiri, Technical Director: It's basically constant team action from the start, because it's a much more condensed version of the game. Right away, you've got your Ultimate, everyone's picked these random heroes, essentially. The three random choices you'll get are from a specific role, so if you've got warrior, you'll have three different warriors to choose from. You immediately are dumped right in and start battling it out in this insane game mode for three rounds. The other cool thing is, you've seen in the opening ceremony video, we'll also do wacky games every now and then where you might get the same Hero. Everyone will be playing as Sgt. Hammer or everyone will be playing as Murky. Shacknews: I have to ask about Cho'gall! How did you come up with the idea for a two-player character and, logistically, how is this even going to work? Hodgson: We feel like we really just wanted to explore the full space of heroes. 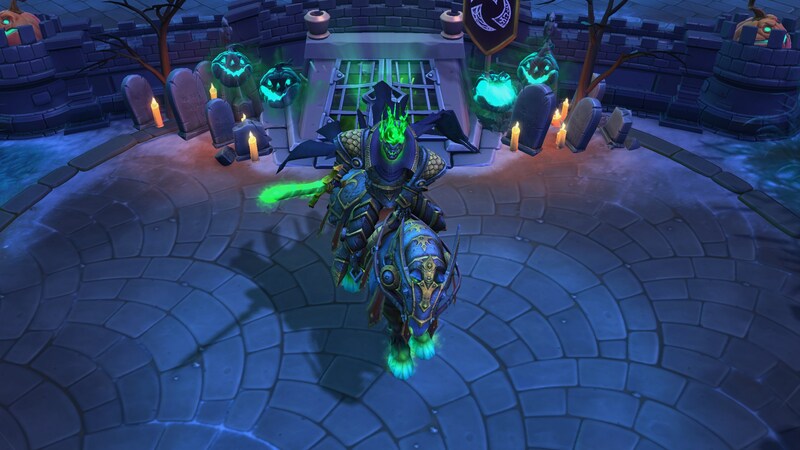 We tried to do that before with Abathur, a Hero that doesn't engage in combat; Murky, a Hero that constantly dies; Leoric, a Hero that never dies! So we wanted to spin off this concept where we had the Lost Vikings, which were three Heroes controlled by one player. Wouldn't it be awesome if you and an allied player could control the same Hero? We spent a lot of time iterating on Cho'gall, because he was the obvious two-headed ogre with the Blizzard history and lore behind it. We wanted to try to capture that. The way that it works is that one player controls the legs and has one set of abilities. And another player controls all of the magic and heavy firepower, so it's kind of a heavy tank/caster class. Having a Cho'gall on your team means your team has essentially four Heroes, instead of five, so there's crazy gameplay implications for that. You can't cover as much ground, but you're much stronger than players might think you are. Shacknews: That was my next question: What kind of damage can this guy cause? Let's say you have a pair of teammates that are completely in sync with each other. They're really close! They can practically read each other's thoughts! How much damage could that Cho'gall cause? Hodgson: I'm not gonna lie, it's been a lot in our internal playtesting. Cho'gall causes teams to think differently about balance. Balance considerations are that if Cho'gall gets ahead, he'll start steamrolling people, but if he was behind, it was very difficult to come back from. I did notice from the internal playtest that he can kick out an insane amount of damage. Especially when he comes out, people will find, "Oh, that's a single Hero in the lane. I should be able to attack him and inflict some damage," or "Oh, I don't have to worry about it." You do have something to worry about with Cho'gall, because he's essentially two characters in one. Shacknews: I'm fascinated by the way you decided to distribute Cho'gall. How did you come up with this idea to essentially make him a viral character? Dabiri: It's such a cool Hero that two people play, so we started talking about what were some cool ways of revealing this Hero and announcing this Hero. So it kind of made sense that it's such a social experience to find someone to play, why not actually let it spread in that kind of manner, too? If you can find someone to play with, I'm sure there's going to be chat channels, forums, and stuff where people are saying, "Who wants to play with Cho'gall?" Finding a way to spread it out is kind of a cool mechanic and I think it got a lot of good reception from the crowd at the opening ceremony. Shacknews: I'd like to move on to the other two Heroes. What can you tell me about Greymane and Lunara? What do they bring to the table that's different from other Heroes? Hodgson: With Greymane, we really wanted a transform hero. We thought about a Druid, a Zerg evolution, but we're excited about the worgen fantasy. We wanted the gameplay of a ranged attacker that wears you down from distance, but then when it's time to go in for the kill, you transform into worgen form. You're a little more vulnerable because you're closer. Just being melee makes you more susceptible to damage in HEroes of the Storm, but that's when you deal the most damage. You can really seal the fate on something. That's really the gameplay we were going for. Lunara is our dryad Hero and she's another ranged attacker, similar to Greymane in some ways. Her play style is very flighty. You want to stick people with your spells, because you want poison to stack over time with them. What's unique about her is her trait and her movement ability. She can't mount, but she's essentially always mounted. She's always bounding around and is always a little bit faster than everybody else in games. She's able to keep distance and travel and fight very quickly. But it does cause some strategic consideration when moving in lanes. Shacknews: Towers of Doom - You basically went in a different direction with this battleground. What was the design goal here? Hodgson: We're always interested in exploring differents kinds of map and not just 'Kill the Core.' We really that ruins how we can just explore the space that this genre has. So we thought, what if we kept the core gameplay of attacking towns and controlling space, having team fights and objectives, but we have a different end game? That's where Towers of Doom comes in. It's sort of like Arathi Basin, the battleground from WoW, that we're riffing off of. How many points can you control and how does your team strategy change with the more map you control? We were really thinking we want to be able to push maps in different mechanical ways and this is our first step. Shacknews: Your friends over on the Overwatch team revealed that Tracer is eventually coming to the game. What is the design goal with the Overwatch characters? Hodgson: Let me say that the design goal with any Blizzard Hero is to try and stay true to that character, their fantasy, the way that they play. Really, that's the same with Overwatch. The only difference is, we're just now getting to play Overwatch with the beta and it's not set to come out until the Spring. The difference with Tracer and many of our other Heroes is that we worked closer with the Overwatch team to learn who this Hero is, sort of delivering on the core gameplay, as close as we could to what Tracer is in Overwatch. We have a little more leeway with characters like Thrall and Jaina, because they've been around, they've done so many different things, there's so much to draw from. But in Overwatch's case, they're building their characters as we speak and people are beginning to engage with that and we want to respect who that character is in an even more tight way. Shacknews: You're constantly iterating on balance, constantly issuing balance patches, most recently issuing an adjustment to Stitches. Are there any other characters you're looking to balance and are there any requests from the community? Hodgson: We're definitely at a lot of our old Heroes. The last patch you saw the warriors somewhat changed and revamped. I think that was a huge success for us in thinking about warriors in different ways, like what sort of team compositions does one warrior fit in versus another. For example, we tried to push Stitches in an anti-Mage direction, we tried to push Chen in a more 'in your face' kind of damage direction. I think the damage team is looking into other archetypes. If there's a Hero that doesn't quite fit in a specialized way and is underplayed, then how can they make that character viable in even just a niche way? I know the team is looking at Gazlowe and Tychus. Dabiri: Also, just even Heroes that are already well-liked, well-picked Heroes, the talent choices and the ultimate abilities. Maybe there are Heroics that we find that not many people are selecting them, so we kind of want to re-visit those and give them a different take to make them more attractive, make it balanced between the two different Heroics. Look for more on the new Heroes of the Storm content soon, including some hands-on impressions with the Towers of Doom and a valiant attempt to step into the role of Cho'gall. Stay tuned. Cho'gall baffles me. Can you even select him in quick match without having a party? Even if you could, would you really want to? If you get a bad player controlling the legs, you've made two players bad instead of just one. One person picks Cho (warrior) the other picks Gall (assassin) (might be reversed) and it matches you. It gets weirder with Hero League, though. The old-school Warcraft crowd does not like you right about now.